If the fabled black marlin is the king of what are called “big game” fish—and the stuff of the works of such salt water sportfishing luminaries as authors Ernest Hemingway and Zane Grey—then the giant bluefin tuna is a close second. The waters off Atlantic Canada boast the largest bluefins anywhere—including the all-time world record at 1,496 pounds and 13 feet long, caught in Nova Scotia waters in 1979 by Dartmouth native Ken Fraser, who has since authored a book on the experience. It’s still possible to hook into a giant bluefin in late summer and fall as they migrate past our shores en route to Europe—but tussling with one is not for the faint of heart. Landing a fish that weighs several hundred pounds, and that can swim short bursts at more than 65 km/h and pull like a freight train, requires specialized (and expensive) equipment, and often demands hours of back-breaking work. Atlantic Canada’s waters are home to some of the world’s largest bluefin tuna, like this one. Tuna ranks among the highest-valued seafood anywhere. In January of this year, the owner of a chain of restaurants in Japan once again set the record for purchasing the most expensive bluefin, paying US$1.76 million for the 488-pound fish. Japanese restaurant owners compete annually for the prestige of buying the year’s first tuna at Tokyo’s Tsukiji fish market. 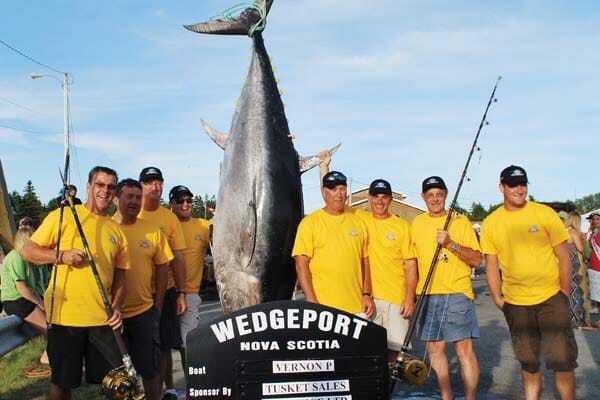 The Wedgeport Tuna Tournament takes place this year from August 18-24. The cost is $1,200 per team of six, including the captain. Add extra money for food, fuel and equipment. You’ll need to buy, beg or borrow fishing gear. Oh yeah—and you’ll need a boat, which can be arranged through the organizers. Entry fees for the Halifax International Tuna Tournament, which runs September 19-22, are $2,000 for the first four members and $250 per additional team member, to a maximum of six. Fish landed in this tournament are sold, and the proceeds donated to the IWK Health Centre Foundation. In order to optimize the charitable contribution, a portion of the tournament entry fees is directly donated to the IWK in lieu of cash prizes to the tournament winners (who receive only glory). Tuna weigh-ins and vessel dockage are at the South Battery Marina (Bishop’s Landing). Info: bluefintournament.ca. Starting in 1937, Wedgeport, NS, hosted the International Tuna Cup Match and became known as “the tuna fishing capital of the world.” The likes of Franklin D. Roosevelt, Ernest Hemingway and Canadian celebrities like Jean Béliveau came to this small Acadian community in southwest Nova Scotia in pursuit of the mighty bluefin. Alas, by 1976, the tuna had dwindled for a number of reasons, and the tournament faltered. But in 2004, the event, now known as the Wedgeport Tuna Tournament, was revived. Bluefin have been showing up again off our shores, and their smaller cousins, albacore, yellowfin and bigeye, are in abundance. Jules Boudreau’s been hooked on tuna for 60 years. He grew up in Wedgeport and worked as second mate on one of the boats during the early 1950s. “It was adventurous, exciting, challenging—and a great high when we landed one,” he says. Although Jules has lived in the US for most of his adult life, as soon as he heard the tournament was revived, he signed up. Last year was the best tournament yet for his team. Although the first day on the Vernon P. went by without sighting a tuna, at 7:30pm one took hold—only to win the battle within 30 minutes and escape. An hour later, there was second strike—but again, things went awry; the rod broke. Then Jules baited a rod with a mackerel and set it over the side. “As I was attaching a small balloon to the line to control the depth,” says the 79-year-old, “off it went as if we’d hooked a freight train. It pulled half the line off the spool with 50 pounds of drag before slowing down.” By 2am, a whopping 730-pound gutted tuna had been put on ice and was safe in the hold—the grand prize winner at the end of the tournament. The year before, first place had gone to a women’s team aboard the Ol’ East Sider. Falon LeBlanc boated a tuna that weighed 626 pounds. The first time the feisty nurse took part in the tournament in 2007, the boat sailed 12 hours to a popular location called “Hell Hole,” but unfortunately someone lost the gaff overboard. 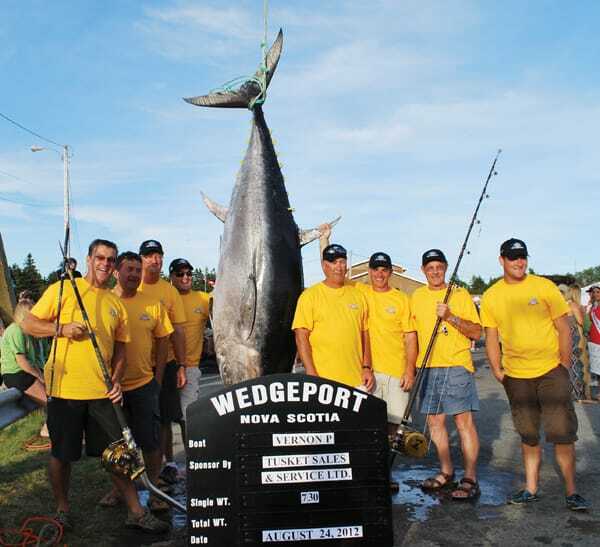 Prince Edward Island also enjoys a history of sportfishing for the big tuna—a prize many anglers consider landing one of the greatest achievements in the sport. While its popularity as table fare and the resulting commercial exploitation has not been good for the species as a whole, and rigorously enforced bag limits are imposed, good sportfishing can still be found from charter boats (mainly operating out of North Lake) in the waters off Prince Edward Island, where some of the largest tuna ever caught have also been landed. However, if you are not interested in actually catching one of these magnificent fish, it is still possible to appreciate them in their natural surroundings. Captain Kenny McRae operates the WayPoint 04 out of Tignish harbour at the very western end of Prince Edward Island. Starting in mid-August, the tuna move into the area to feed on herring and mackerel. The four-hour outing provides the opportunity for tourists to board the WayPoint 04 for a journey on the water to not only see these massive fish up close, but to feed them as well. First up is fishing for mackerel, which are abundant and easily caught once the sonar locates a school. For youngsters, this is a great introduction to the world of sport fishing, because it’s generally action-packed. Once enough mackerel have been caught, it’s time to look for the giants that are lurking below. Captain Kenny has an incredible success rate at finding the bluefins and, once he does, the real excitement begins. The sight of a 500-pound fish coming straight up to the surface to snap up the mackerel tossed to them by the guests gives an adrenalin rush to all on board. Some of the giants run more than 1,000 pounds. As if the fishing and the feeding were not enough, there’s an abundance of other marine life. Minke whales are common as are harp and grey seals. Gannets diving like airborne torpedoes are always an amazing sight. All in all, it is a terrific boat trip. For more information, check out giantbluefintuna.com and be sure to watch the video.